Honey Co provides a simple-to-use solution for seniors who want to remain in their home and for their family members. With a quick tap on an app, Allison Dean Love can check on her 82-year-old mom. Though she lives 500 miles away, she knows her mom is going about her day in Tennessee. And Love breathes easier. But just five months ago, the gut-check reality of aging hit. Love’s daily email wasn’t answered and Mom hadn’t made her daily call to a nearby relative. She didn’t answer the phone. Amelia Dean had collapsed on the floor from dehydration and was found by a nearby cousin as Love and her husband raced from South Carolina to Nashville. On the way, Love sent a flurry of texts and made calls to family and friends. One of those calls was to cousin Lisa Dean, who told her about a new startup she might be interested in using. Love called immediately. “I still remember where I was when I talked to Zack,” Love recalls. Driving through Knoxville, she called Zachary Watson, CEO of Honey Co Homes, a new software and tech services provider that brings non-invasive safety technology into homes. Her mom would be OK, but she can get dehydrated easily because of a health condition. Within 10 days, a motion detector connected to Honey Co software, and Love’s phone, was installed in every room of her house. “This has brought so much comfort and peace of mind to me,” Love explains. While home monitoring is not new, Honey Co Homes software and support offered Love a cohesive, non-invasive, no video approach. Mom and daughter both get what they need. Importantly, her mom doesn’t have to change any behavior. Since, the family has also installed stove shut-off and easy-to-use communication. Love taps a button and says hello to her mom, who doesn’t have to do anything techie, just answer. It looks like an iPad, but is only accessible to Love and her mom. 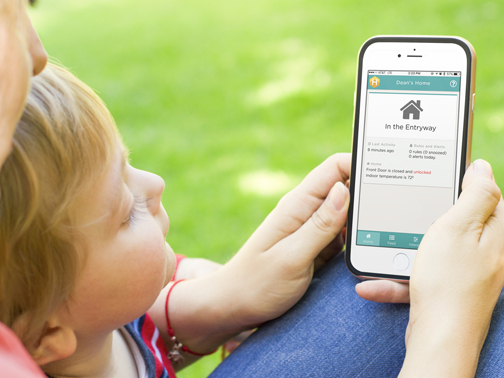 Recently, Honey Co Homes and Caregivers by Whole Care announced a partnership marrying the tech-savvy home options with caregiving. Elizabeth Moss, a nurse, started Caregivers by Whole Care in 1997. The rising demand for care at home and on weekends, turned into a business. Twenty years ago, only three other entities were offering similar in-home help. Now, Dean, estimates there are about 280 similar companies in Nashville. By 2029, when all Baby Boomers will be 65 years and older, more than 20 percent of the total U.S. population will be over the age of 65, according to a U.S. Census report. That’s compared to 13 percent over 65 in 2010 and 9.8 percent in 1970. Honey Co raised $1.1 million in investment capital in 2016 and plans another effort this year. Its office in Sylvan Park is in a converted home, now installed with some of that technology as a demo that Watson says often surprises people with its unobtrusive look. Watson, who earned his MBA at Stanford and is an investor, ultimately chose Nashville to launch Honey Co after an exhaustive search of every MSA in the continental U.S.
After narrowing to six places based on population, demographics and more, Nashville won. “Nashville beat everywhere else primarily because of its network of volunteer services available,” he says. Just like Amelia Dean, many seniors do want to stay in their homes. An AARP Public Policy Institute study shows 87 percent of those 65 and older want to live in their current community as they age. Honey Co has teamed with Whole Care to offer seniors and their families a solution for aging in place. What it takes, often, is a village of different levels of care and connection. In late 2016, after Honey Co had researched local in-home care companies, eventually having conversations with about a dozen to learn more and potentially collaborate. Other companies had wanted Whole Care to buy equipment, and that just wasn’t feasible. “We saw Honey Co as opportunity to get people to start thinking about aging in place,” she adds. A package the two are planning to offer is a package base of Honey Co and four hours of caregiving per week that could just be light housekeeping or running errands. “That’s an easy way for that independent senior to start,” she says. The two companies recently talked with case workers at a local hospital about how cohesively technology and caregiving could serve their patients. 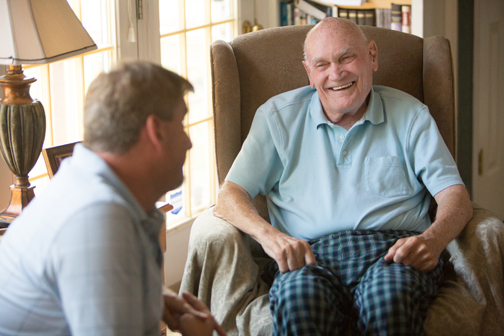 Whole Care connects and refers with hospice, assisted living, some home health companies, independent living communities, churches and more. Honey Co is interested in doing the same. “Ultimately, one of the few things that drive us is that there should be affordable options for anyone differently abled or who wants to age-in-place, and they should be entirely accessible to all,” Watson says.